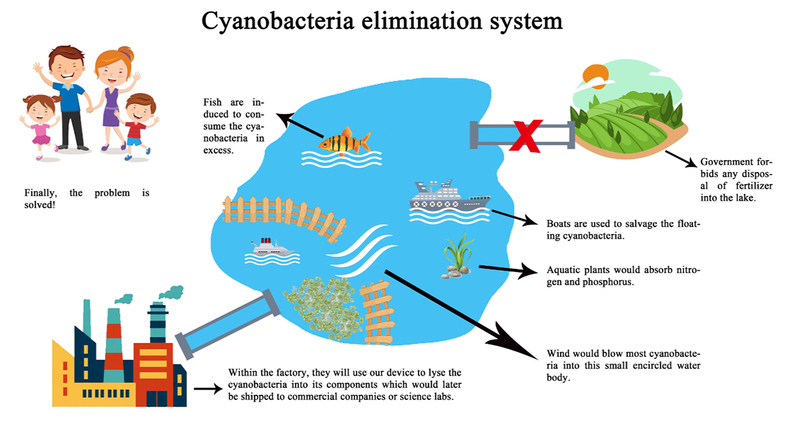 CyanoElimination: The lysis of Cyanobacteria in freshwater ecosystem using Cyanophage lysozyme and its commercial implications. The rampant growth of cyanobacteria in freshwater ecosystem has become more than an environmental issue. Their incredible ability to multiply and voracious consumption of oxygen often make them a disturbing factor to natural systems. We realized during public outreach that although effective ways to gather and salvage cyanobacteria have been developed, there are barely any success in decomposing these bacteria. Our team identified a cyanophagelysozyme, cp-OS lysozyme 1. Alone with other chemicals such as bugbuster, this lysozyme in small reaction systems could lyse the cyanobacteria effectively. Through a series of experiments, we were able to acquire the recombinant protein from E. coli cells. Our modeling helped us to find the best experimental conditions for a prototype device which would contribute to a system of cyanobacteria elimination. Our research lays foundation for the utilization of cyanobacteria components in agricultural, bioenergetic, and even medical fields. Here we presents you with a minecraft video on the introduction to our project.